As Psychobillygirl will tell you, the 80’s have a great deal of redeeming value. In retrospect, I guess I think so too. I think back to things then that seemed so much simpler than how life turned out. I hope its not a change in the world all together and just me needing to get back to where I was…or maybe who I was, not necessarily in that place anymore. It’s cool though, finding things out about yourself that were always there…comforting really. 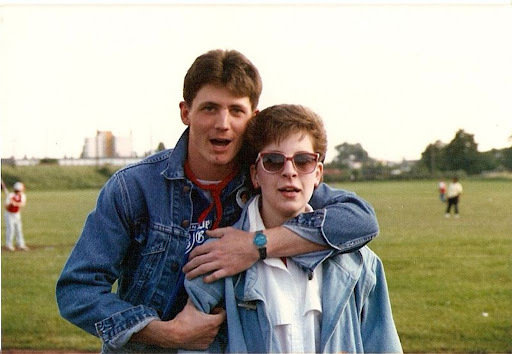 Now if someone can just explain to me, what were we thinking with big glasses and acid wash denim? Not the best of the 80’s…ROTFLMAO. UPDATE: NOW MY CHALLENGE TO ALL OF YOU IS TO POST AN 80S FLASHBACK OF YOUR OWN…COME ON GINGA, YOU KNOW YOU WANNA! Previous Post Do I have to pick just one? Next Post Not in a Catholic High School, you won’t! Haha, I know. And can you believe I still have a denim shirt with studs not buttons and I still wear it occasionally cos its so comfortable. Should I be embarrassed? Oh no, if I should be embarassed I will never wear it in public again. And I suppose my Adam Ant spangley jacket has to go too?